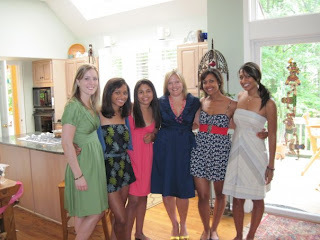 Ashley's Antics: My Bridal Shower! My Bridal Shower was this past weekend and I had a fabulous time! The events started on Friday night when my best friend (Alex) from High School drove all the way down to Maryland from Connecticut to spend the day with me. On Saturday, Alex and I woke up early and headed down to my mom's house. My sister, and maid of honor, hosted my shower and she did a fabulous job. The event was a ladies luncheon and each of my bridesmaids provided an light lunch entree for the event. The decor was hysterical and as you can see below, they tried their best to dress me up. The garter lasted all of five minutes. Several of my friends could not make it to my shower, but we still had at least 30 people there! It was mostly my mom's friends, my soon to be husband's mom's friends, and my family rounded out the guest list. Don't fret though, all of my bridesmaids were in attendance and my friend "true blue" (a.k.a. Kristin) came down as well. Here's Mari, Noelle, Me, Alli, Alex and Kristin! 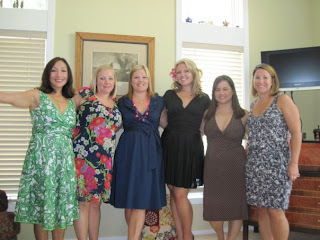 And here's a picture of me and the bridal party- including John's two sisters who were not in the previous picture. I was blessed with some amazing gifts and I had the best time. Seriously, I wish we could get married everyday because what's not to love about a little ladies only time and some great food? I wanted to include a picture of the shoes, since you ladies all weighed in on my options. Unfortunately, I forgot to get my toes in every picture. You can kind of see the shoes in this picture with my sister and cousins. One of the highlights of the day-- this cake! My Bridesmaid and future sister-in-law Erin designed it for me. Do they know my interests or what? sounds like u had a great day! The cake is gorgeous! and ur shoes look fab with ur dress! Looks like you have a great time! I am so sorry I missed it! Blah. Looks like a blast though. Glad you had a good time. looks awesome!! LOVE the cake. And your shoes were seriously fabulous!! Looks like a great time! That cake is amazing! Looks like it was so much fun! I love that dress, too! Great pictures! I'm sad that I couldn't make it. I LOVE your dress! You look so cute! I'm so glad you had a great bridal shower. Can you believe we will both be married ladies soon? Not too much longer! I can make out enough of the shoes to know you looked fabulous! I'm glad you enjoyed your special day.